Ballybunion Golf Quote:"After playing Ballybunion for the first time, a man would think the game of golf originated in Ballybubion,'' he said. "Ballybunion has a real wild look to the place,'' he said. This week's field includes defending champion Sergio Garcia, past winners Ian Woosnam and Bernhard Langer, and Darren Clarke. Most, though not all, of Europe's best will be here, the exceptions being Colin Montgomerie, Lee Westwood, and Paul Lawrie. Seve Ballesteros called the course "a piece of art, a unique stretch of land. "It made me feel the same way as when I first saw St. Andrews. The magic is the same,'' said the Spaniard, who won the second of his three British Opens at St. Andrews in 1984. The winner could be one of Ballesteros's two compatriots, Jose Maria Olazabal or Miguel Angel Jimenez. Irishman Padraig Harrington had never played the course before this week. He is coming off a fifth-place finish in the U.S. Open at Pebble Beach 10 days ago. What the pros had to say about the most famous links course on earth. 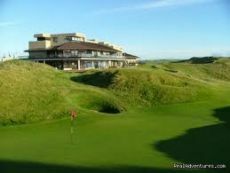 On the 9th July 1998 Ballybunion played host to six of the worlds leading golfers. Tiger Woods, Payne Stewart (RIP), Mark O'Meara, Ernie Els, Jim Furyk and Andrew Magee tested their skills in preparation for the British Open. introduced the course to a worldwide audience. A tired Watson shot a level-par 71 around the Old Course on his first visit and concluded, "After playing Ballybunion for the first time, a man would think the game was invented there". "Having played the Old Course many times since my first visit in 1981, I am now of the opinion it is one of the best and most beautiful tests of links golf anywhere in the world." "I heard so much about the place, and I am not disappointed"
On his visit to the course on the 12th of July 1989 'Golden Bear' played with his son Gary viewed by a gallery of 1,500 people. "After playing Ballybunion for the first time, a man would think that the game originated there"